Happy New Year and happy snow season! It’s a great time of year to enjoy the beautiful outdoors. I have been enjoying my jogs around the lake and love everything that our lake community has to offer… the beautiful lake view, the smell of the wood stoves and fireplaces, the camaraderie of the neighbors, and the beautiful snow. Which brings me to the point of this letter. While walking my dogs on the street, I noticed many piles of dog feces – aka poop. First of all, at night, I can’t see the poop and have stepped in it and that is very unpleasant. My dogs also step in it and then it ends up on their feet. People don’t think much about it — but as a veterinarian, here are all the things I see in my practice related to “not attending” to dog poop. Dog feces may contain parasites or eggs that are transmissible to children and to other dogs. If the poop is contaminated with round worms, tapeworms, hookworms or giardia then our properties become seeded with these parasites. It’s microscopic so you can’t see it. If children accidentally ingest a roundworm egg by being exposed to dog poop, the results can lead to blindness or other medical issues. It’s called ocular larval migrans or visceral larval migrans. Scary stuff. The worm eggs stay in the snow and then kids throw snowballs and might be innocently exposed to these parasites. And your dogs can get sick too. They might have loose poop or gas or even a belly ache from accidentally being exposed to the feces. Having your dogs routinely dewormed by your veterinarian helps but it NOT the only answer. The solution is simple. 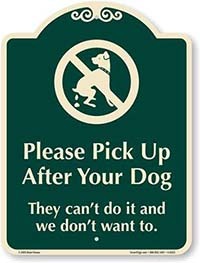 Pick up after your pets, PLEASE. It’s so awful to see the piles of poop and not feel like one of us doesn’t care enough to keep our beautiful little lake community streets clean. So here is a reminder to everyone, old neighbors and new neighbors: pick up the poop. It’s for everyone’s safety, especially your children and your dogs. And clean up your yards so the eggs and parasites don’t soak into the ground and re-infect your dogs or cats. Thank you and if you have any questions regarding this letter, please feel free to contact me at cgamez@georgetownvet.com.